How can I purchase parts for my GI Firearm? a: Our online store has all parts available, you can also call us to order anything you need and check stock availability. * All of our parts are oversized, so fitting will be required. What are the CA compliant pistols? a: M1, M2, and the Glock Conversion. What is the current lead time for a custom build? a: Our current lead time is 18-22 weeks. Our in-stock pistols will ship within 3 business days. Why does it take so long to build a GI 1911? a: Every pistol is handcrafted from the ground up. Our gunsmiths are detail oriented perfectionists who hand fit every part to ensure reliability and accuracy. Once the pistol is built it goes through testing and evaluation. Should I dry-fire my pistol? a: Yes, we encourage you to dry-fire your pistol to become familiar with the trigger and reset. No, this will not harm the firearm. Should I lubricate my pistol? a: Yes, we recommend using SLP2000. What type of ammo should I use? a: Our firearms are tested to run any type of ammunition. The only exception being the .50 GI firearms which can only fire the .50GI round which can be purchased directly from us. We also sell reloading components for the .50GI. Where can I buy .50 GI ammo? a: Directly from us or contact one of our dealers. How many magazines are shipped with a GI pistol? a: Each pistol comes with 2 fitted and tuned magazines, if you would like to purchase additional magazines you can do so online in the store or by calling us directly. Does GI have a warranty? a: Absolutely, when you purchase any Guncrafter Industries, LLC. product, do so with the knowledge that we stand fully behind every product we build and sell. We will without hesitation take care of any issue that we deem related to our craftsmanship or any component used to custom build a Guncrafter Industries Pistol. We will not be responsible for any damage from neglect or use of poor quality ammunition. We do stand behind our products when used for its intended purposes. 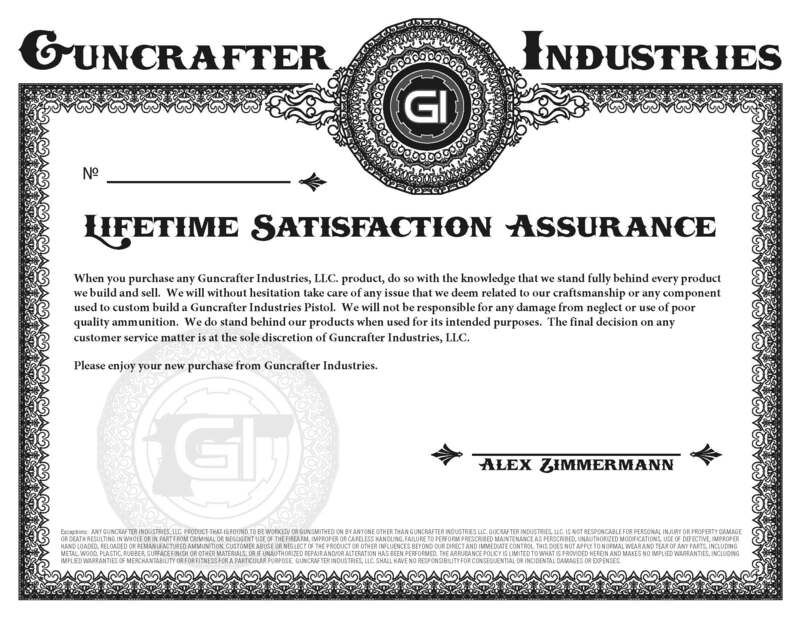 The final decision on any customer service matter is at the sole discretion of Guncrafter Industries, LLC. How do I return my gun for warranty? a: Please contact our Sales Manager to obtain a shipping label and warranty form. What is the standard trigger pull on GI firearms? a: Our standard is 3.5 lbs. Where is the price list for pistols and options?